Let me start by saying nothing beats a good slice of pizza. A while ago I would have thought that a simple taco, or maybe even a cheese burger would trump a slice of pizza, but I think I am sticking with the pizza. You have probably noticed that I have been making a lot of pizzas recently, and different ones at that. Everything from the Muffuletta pizza, the BBQ pizza, the jalapeño popper pizza, and the buffalo mac and cheese pizza, only to name a few. Well, low and behold as I was shuffling through some items in my freezer, I noticed a package of homemade gyro meat that I had recently made, and as I already had a batch of dough prepared, it came to me that a nice gyro pizza would be pretty darn awesome. I don’t know about you, but I love a gyro sandwich. There is something about the flavor, texture, those thick onions, tomatoes, and tzatziki sauce that, well, is a perfect combination. As sloppy as eating a gyro can be, depending on how it is prepared, I figured that a pizza would be a great vehicle to serve everything you love in a gyro on. Make the dough by adding the flour, yeast, salt, and sugar. Mix. Add the water, and with your wooden spoons, or hands, mix until blended. I use my KitchenAid for this process to keep everything in the bowl during the rising process. Mix for about 30 seconds. The dough should be a bit stiff. Cover the bowl with a towel, and let it sit at room temperature until the dough has doubled in volume, about 2 hours. You can do this ahead of time as well, and place in an oiled container, big enough to house the dough, and place in the refrigerator overnight. Preheat your oven to 475 degrees, and place your pizza stone, or sheet pan in the oven to preheat. Once preheated, let the stone stay in the oven for about 10 minutes to get nice and hot. Once risen, divide into two portions. With one of the portions, add some flour to a large pastry board, and take that portion of the dough, and form into a large enough piece to place onto your pizza stone. Once the pizza stone is hot, carefully place the formed pizza dough onto the stone. Lay on the sauce and evenly spread it onto the pizza dough. Top with the mozzarella and feta cheese, and evenly distribute that. Top with the chopped gyro meat, and the sliced red onions. Place in the oven and cook for about 25 minutes or until the crust is nice and golden. Remove and let it sit on an aerated rack, if you have one, for about 5 minutes. Before serving shower the pizza with the fresh, chopped tomatoes and drizzle on the tzatziki sauce. Slice and serve. 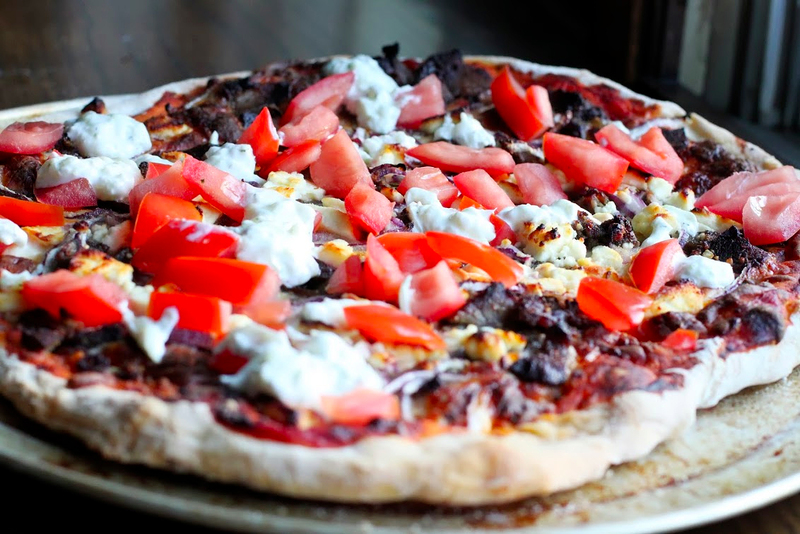 This pizza is everything you want in a great gyro, but not as sloppy. You get that familiar bite of the gyro meat and the red onion, and then that fresh tomato and tzatziki sauce hit you and it becomes this rollercoaster ride of flavors. 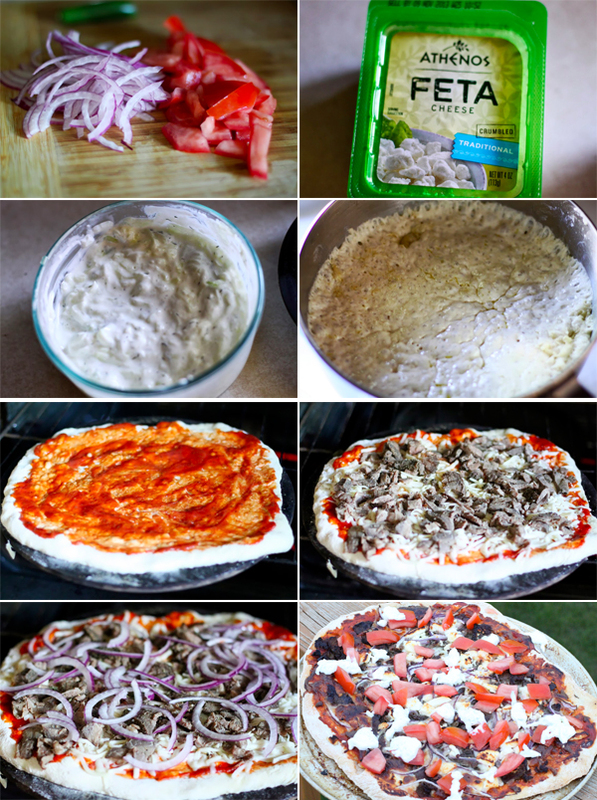 This gyro pizza is one to make, I guarantee it. I hope you enjoy! I made your gyros meat recipe a couple of weeks ago and it was wonderful! I made a pizza with it as well as a pita gyros AND gyros ingredients on a smashed baked potato. All wonderful but have to say, the pizza is spectacular. That said, I REALLY like having a way to make the meat, so thanks for all! I actually made this the other night and thought I would come back to say thanks. It was delicious! Is it possible to replace the lamb and beef with chicken? I seen your recipe for “gyro meat” but if I wanted to sub chicken in for this, is that possible? And also make the chicken the same way you make the gyro meat? Wanting to make your gyro pizza but just with a leaner meat. Hi Cait – Sure, go ahead and try it with chicken. I’ve yet to make that, but anything is possible.